Wisdom Science: Pick A Pattern And See What It Says About Your Personality! 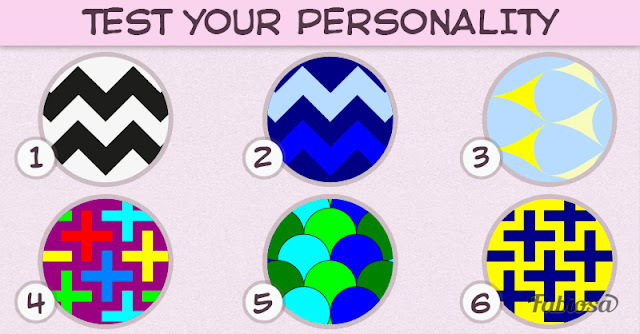 Pick A Pattern And See What It Says About Your Personality! All choices that we make are based on our life history and on our personality. Look at the six figures below and choose the one that speaks to you, and then find out what interesting things it reveals about your personality. You are very demanding of yourself and others. You are someone who is all or nothing! Not everyone can understand you, so conflicts and misunderstandings are inevitable. However, you’re the one who creates very intimate relationships with real friends. In love, you pay attention to the sincerity and dedication, essential to a long-lasting relationship. Feeling that you are loved is essential to you, otherwise you move away or isolate yourself until you can recover from the disappointment. You are not able to wear a “social smile” or disguise your feelings. You need freedom to feel happy and you feel suffocated if you do not have it. You are an individualist and prefer to do things alone rather than wait for others. You have gifts that stand out in both the artistic world and your work life. You do not like when people are fake, and because of that, you give a personal touch to everything you do to always be authentic. You stay true to your principles and convictions, even if it complicates your life! You are not afraid of such complications anyway! You were born to be a leader! Adventure is your middle name. You like to push your limits and participate in anything interesting and captivating. You seek to escape from routine, but when you have to live with it, you see things from a different perspective. Serenity, tranquility, and a sense of calm define you. You are very reserved. When you make friends, you choose to spend time with those people that share your fun-loving characteristics. You do not like strict limits or rules that do not let you be who you really want to be. You are the kind of person who is serious and prudent, since your image and name are very important to you! Your honor and dignity are above all else. Everyone knows you as a responsible person, who always points out the potential consequences of their actions. When something leaves you worried, it bothers you until the situation is fully resolved. The opinions of others are super important for you, so you always pay attention to what you hear. You never act without thinking first and you recognize your own mistakes and failures, trying to constantly improve at everything you do. You do not think much of people with cold personalities. You are very sentimental and you seek perfection at all times. You are not satisfied with just any old thing and have a dislike for poor quality. You need the help and support of other people to feel confident and safe.